Only a real vinyl lover understands the importance of record players and keeping them in an adequate condition. The majority of people nowadays relied on online music, but they don’t know what it feels to listen to music in its purest form. If you are reading this post, then you are certainly worried about keeping your record player safely. In this post, we will talk about best record player stands available in the market. Agree that! Finding a high-quality item out of hundreds of products is not an easier task. Every brand claims that their product is better than other. We have created this post to vanish your tensions as our expert team will talk about record player stands in it. Having a problem with record storage? read our awesome guide about a list of vinyl storage. 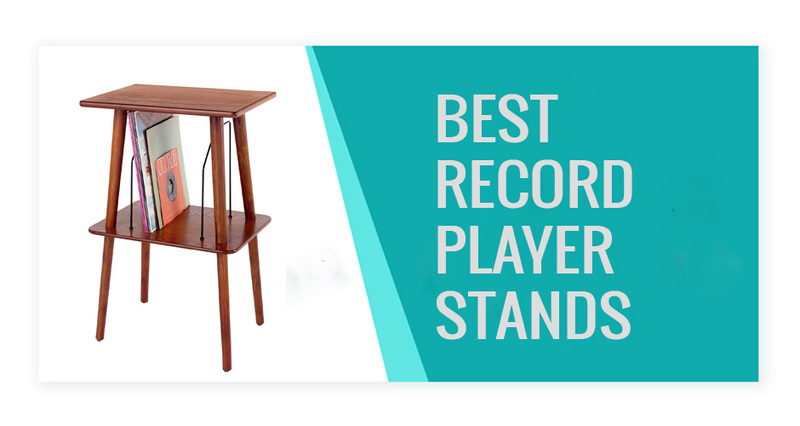 Top 10 best record player stands under 500 in 2019? No one has enough time for checking each product in the store or online websites due to a fast-paced life. However, still spending money on a cheap-quality product isn’t a wise decision. That’s why our team of experts has performed that task for readers by creating a list of top 10 best record player stands that you can buy this year. Each one has their set of features, and we suggest you buy that suit you perfectly. Now, we will start the list without any further delay. This amazing product manufactured by the Nexera brand is multi-purpose equipment sold by the company in four different colors, like truffle, black, American beech, and Moka. There are four open storage shelves in this product offering enough space for keeping the turntable as well as records. You can keep the record player in one of these shelves, whereas the rest of the three can be used to keep things like vinyl, amplifier, headphone, speakers etc. Additionally, this stand designed in such a way that one can easily offer the wire access to their turntable. Additionally, the air flow is quite brilliant that is important for the safety of electronic devices. The company has used CARB II certified board and high-quality MDF materials that prove how amazing quality product it is. Furthermore, you can adjust the shelves to keep the other items in this stand. There is beautiful dark brown truffle laminate finish added to the stand for making sure it looks beautiful in your room. The process to assemble this stand is very easier as you will get a complete instruction manual with it. On top of that, it has a very contemporary design that makes things easier for buyers. This stand offers very easier access to the cable for the users. It has enough space to fit in all types of record players. Sold by the company in many different colors. The weight of this stand is a little bit heavier. If you are looking to buy a simply designed product for your record stand without spending lots of money, then this product by Winsome can be the perfect choice to make. It is the best record player table that comes with two large shelves. You can use the first one to keep the turntable, whereas the second one can be used for keeping a plethora of accessories according to the convenience of buyers. This stand isn’t built especially for the record players, but the majority of people find it perfect for this electronic device. It is a perfect value for money and turns out to be a great investment for you. The customer can also buy the wire baskets, but the company sold it separately in a set of 2 and three units. It has an open airy design that offers enough space to the buyers. This product is manufactured using pretty high-quality composite wood that ensures the stand last long for many years. It is an exciting product that you can buy for making sure record player look brilliant in your house. The open airy design ensures proper airflow across the turntable. Made using top-notch wood material ensuring product last-long for years. The assembly process is a little bit complicated. Finding a better stand than this product manufactured by Bush Furniture is a very difficult task. It comes with tempered glass shelves having vibration dampening pads to boost the sound quality. This product is one of the best record players stands for individual who never want to compromise with their music. No doubt the price tag of this stand is higher, but you can’t complain after seeing its design and quality. There is a back panel installed in this stand that makes the rear wire access easier than ever. Furthermore, they have added concealment for organizing the audio & video cables in a better way. This record stand delivered to the customer’s doorstep after various standards that ensure stability. The company offered a one-year warranty on this product. On top of that, it has a very attractive open design with a blend of metal finish and glass accents. You will have a very contemporary feel after installing it in your room. The company has put attention to all things carefully to create a perfect product for vinyl lovers. It has a very stylish and attractive appearance that everyone will love to buy. Manufactured using pretty high-quality & solid material. Available with a one-year warranty on this amazing record stand. Many times record stand delivered with missing screws. This beautifully designed stand has the ability to grab eye-balls immediately due to its unique and amazing finish. The company sells it in two different colors, silver, and black. The Ryan Rove brand has manufactured one of best record player consoles having proper airflow that ensure the products stay cool even if you play them for longer periods. They are pretty different from the majority of AV cabinets and crafted in a modern design due to which proper circulation of air take places preventing the record player to get overheated. It has a standing design having five tempered safety glass shelves. Each of them is capable of supporting up to 75 lbs. that is quite impressive. On top of that, the shelves of this stand can be interchanged according to the convenience. Furthermore, there are powder-coated steel legs added on this record player stand that prove it is a very authentic product. The company has used high-quality steel tubing and solid tempered safety glass to create this wonderful product for the buyers. There is ample space provided for keeping musical accessories along with ensuring a clean look. It has a very contemporary and stylish look that will enhance the beauty of your room. Available at a very affordable price considering its quality. Assembly instructions found missing in some boxes. The fifth position in our article held by this amazing stand manufactured by the Line Phono brand. It is specially designed for turntables and manufactured completed in the United States. This vinyl record stand comes with dual storage shelves, and each of them is capable of holding up to 100 lbs. quite easily. It can be assembled very easily with minimal effort. This product has a durable interlocking construction allowing you to adjust the height as per the convenience level. Some exciting features of this product are record stops, cable management system, vinyl accessory shelf, utility hook, and record stops. It is available in many different colors like carbon, birch, natural, and smoke grey. The company has used high-quality MDF material for ensuring the product to last long. There is an adequate space in shelves to install a larger amplifier. It has now spinning grooves that allow the buyers to showcase the vinyl records brilliantly. There are three different shelves in the stand, and each one can fit up to 100 records quite easily. It is a professionally designed stand backed with a two-year warranty. The company manufactures this product using exceptional quality MDF material. Advanced-level stability and leveling offered by its individually adjustable feet. The Pangea Audio brand has done a pretty nice job here to manufacture this turntable stand. It is available in three different colors like Rosenut, black, and carbon fiber. This product manufactured using extra heavy duty material that makes sure your record player get proper security. There is an attractive & sturdy scratch resistant finish provided to the vinyl shelves of the company. The company has provided the much-needed strength and rigidity to the frame. The total storage capacity of this stand is more than 100 pounds. It has very thick shelves that make sure no mishaps happen in any manner. Its upper shelves are perfectly sized for a turntable, whereas you can create an amazing collection in bottom shelves easily. You will get a properly sized product for incredibly showcasing your collection. Furthermore, the scratch-resistant finishes ensure the stand remain new for a longer period. It made using pretty heavy quality top platform for offering the required sturdiness. The bottom shelf can easily accommodate more than 100 records. This record stand comes in decent scratch-resistant finishes. The instructions aren’t easier to understand. This amazing turntable stands specially built for catering the needs of buyers who want to ensure proper safety to their device. It is manufactured by Live Phono brand in four different colors like natural, birch, smoke grey, and carbon. There are very minimal footprints created by this stand on the floor. It comes with dual shelves allowing you to keep the vinyl player and amplifier quite easily. It is one of the best record player stands that completely manufactured in the United States. Furthermore, you will find it pretty easier to assemble with minimal effort. Even a complete novice can complete this task. It comes in a sturdy interlocking design that allows you to adjust the feet for proper stability. There is a special hook added in this stand for headphone and cable. Each of its shelves can keep 100 records quite easily. On top of that, the company has added record stops that make sure the vinyl doesn’t get damaged in any form. They have provided clearance of 4.5” for ensuring no damage to the floor. Overall, it is a complete package that you can buy for keeping your vinyl record and related accessories securely. It is a specialized created vinyl record player having adequate sizing to make your experience better. This record player has a very long life due to its high-quality MDF grade material. It has a rounded finish and pretty beautiful look. The higher cost is an only negative point of this stand. Coming at the eight positions is this amazing concord turntable stand manufactured by the Nobogratz brand. There are two drawers installed in this product for providing additional storage. It is made using pretty sturdy & durable material making the product pretty amazing option to buy. If you have a pretty larger collection, then it is the best record player table to go for. It is available in three different variants for the convenience of buyers. The first one comes with drawers, whereas the second variant doesn’t have any drawers. On the other hand, the third one is a complete audio stand considered perfect for vinyl players. It manufactured in four different colors, like walnut, brown oak, white, and blue. It offers adequate space for storing the vinyl record player in an adequate position. The assembly process is a little bit complicated, but the results are pretty amazing. If you choose to buy a variant with drawers, then it will turn out to be a blessing for your vinyl accessories. There are greater chances these accessories get damaged when you throw them anywhere in the house. However, it remains completely safe in the drawers during non-use. The stand is capable of holding up to 60 pounds of weight that are appropriate for normal turntables. This stand has a retro look that matches perfectly to the traditional record players. It is available in many different colors and variants for the betterment of the buyers. The albums remain safe due metal dividers installed in this stand. You need at least two persons to assemble this record stand. If you choose to buy this amazing stand, then we suggest you get ready for falling in love with its design. The Crosley ST66 is manufactured using high-quality hardwoods and veneers that ensure the product stay in a healthy position for a long time. It has a hand-rubbed paprika finish that will enhance the décor of your house in every possible way. It comes with very beautiful wire record slots making the storage of records pretty easier. This stand will turn out to be a perfect companion of your turntable. This turntable has a very beautiful look that will let you fall in love with this product. There is very light assembly demanded by this player stand that makes it a perfect option to buy. It considered one of the classiest that you can find in the market. The company delivers this product with a 30-day satisfaction guarantee that gives complete peace of mind to the buyers. On top of that, it manufactured by a reputed brand like Crosley Manchester Entertainment that ensures the buyers don’t have to worry about its quality. You can give a perfect home to your turntable by installing this stand in your home. It designed in a very beautiful hand-rubbed paprika finish that can match the décor of any home. Anyone can easily assemble this record player stand in a matter of minutes. There are decorated wire record slots added in this product for better storage. The company needs to improve their customer service. Available in four different colors, this triple wall mounted storage cabinet is an exciting option to buy. You can buy it in black, espresso, oak & black, and cherry & black color. This product is a perfect blend of home décor fashion and practical storage. The company has high-quality & durable laminated composite woods for manufacturing this exciting storage cabinet. We ensure that your turntable will look brilliant in this exciting storage. If you have limited floor space, then it is the most suitable option. Also, the company offers a 5-time warranty on the majority of its parts. All the shelves in this stand can be adjusted according to the convenience level. You only need a limited assembly for installing this stand. It comes with an easy to install rail system that makes things easier for the buyers. Additionally, the company sells this product with an instruction booklet that makes the assembly process easier than ever. To sum up, we can say that it is an ideal choice to make to keep your turntable and related accessories securely. The height of this stand can be adjusted according to the convenience level. It is available at a very affordable price. The instruction manual is very easy to understand. Not ideal for larger spaces. How to choose the best record player stands? The design of this stand should be such that the vinyl will be preserved for a long time. An adequately designed stand helps in boosting the health of vinyl. It can be very uncomfortable to control the vinyl player from an inappropriate height. That’s why we strongly suggest you go for a record player stand that can be adjusted according to the height. No one prefers to buy a stand that looks ugly in their room and don’t match with the layout of your room. The color and design of your stand should complement the décor of your room. The classic vintage look of turntable along with a durable stand can create a mixture in your room. There are hundreds of brands manufacturing the record player stands for customers. However, it is important to identify the quality of the material used for manufacturing this stand. The stands made from veneered plywood, wood, MDF and metal are great and last longer than the others. You can go with the stands made from these materials with closed eyes. A standard record player stand can be bought from as low as US$50 and go up to US$ 1000. You need to make this decision according to your budget. However, anywhere between US$ 200 and US$ 400 will be the best option. Having a turntable stand not only helps in enhancing the beauty of a room but allow to enjoy an amazing listening experience. Our list includes the best record player stands that one can find in any market. Each of them is tested and added after extensive research to ensure you end up making a perfect choice. Also, we suggest you tell the experience with the product you bought after reading this article. It can be very beneficial for fellow readers. We wish you have an amazing experience. what a marvelous user-friendly blog of the turntable. Thanks for providing great info for a newbie like me.